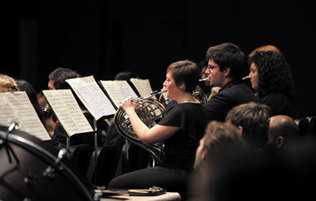 UofT Music has been a national leader since 1946 in the training of music educators for the school, community and university programmes throughout Canada and beyond. And UofT Music has been a key resource for the development of research about educational practice and professional training. Many of our undergraduate students choose Music Education as a specialization when they enter the Faculty of Music, no doubt in part because of the inspiration they received from many of our graduates in school and community programmes. The Music Education program is rich in diversity of offerings, with a very strong core of instrumental, choral and world music pedagogies. We feature courses on teaching music from birth throughout the lifespan, tackling issues of diversity, changing technologies and social justice in global and interdisciplinary forums. At the graduate level, our Music Education students and faculty are leaders in research and applied research in cultural studies, gender studies, vocal and instrumental pedagogy, conducting, improvisation, community music, music and health, and engaging in new research paradigms and methodologies. We lead students to actively engage contemporary issues and trends in music education locally, nationally, and internationally. Our curriculum provides a comprehensive foundation in music skills and understandings and allows for the development of specialised ability. The comprehensive foundation consists of courses in performance, music history, music theory, and arts & science courses; instrumental skills in brass, woodwind, and strings; choral music and conducting; and the philosophy of music education. Specialisation can be developed in choral music, instrumental music, elementary or secondary music education, and other creative combinations. The 4-year Mus.Bac. program in Music Education is designed for students planning to become music teachers at the primary, junior, intermediate or senior levels of the school system, or to teach music in community contexts. Following the 4-year Mus.Bac. degree, graduates who plan to work in the school system may apply for a B.Ed. or M.T. program at a Faculty of Education. Students also have the option in Year 3 of the Mus.Bac. program to apply for early admission to the combined program with the M.T. at OISE (Ontario Institute for Studies in Education).